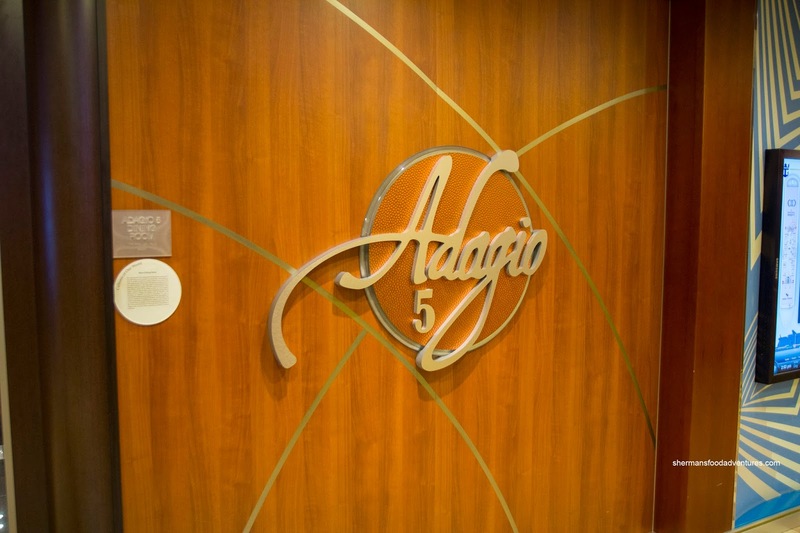 Although we had purchased the Central Park Dining Package (which included Giovanni's Table, Chops Grille and 150 Central Park), the majority of our meals would still be at Adagio (the main dining room aboard the Allure of the Seas). 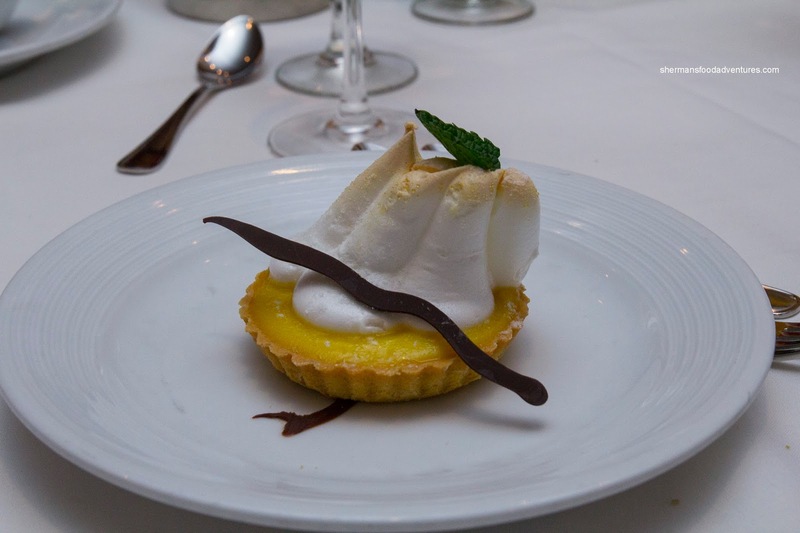 In the past decade or so, we've seen cruise lines building bigger ships and offering more dining choices. However, that has also meant the introduction of cover charges as well. Love it or hate it, at the very least, there is an option for those who want to pay for possibly better or more diverse food options. 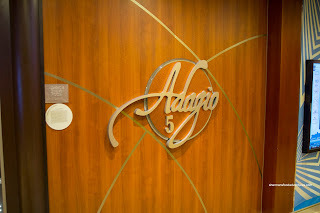 On our second night aboard the Allure of the Seas, we dined at Adagio for our first formal night. We found an interesting mix of items on the menu. 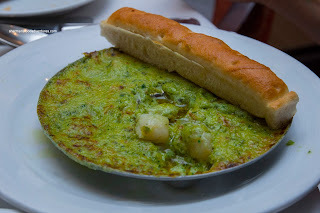 One of which was the Bay Scallop Gratin with garlic herb butter and olive bread stick. Essentially, they replaced the escargots with baby scallops. 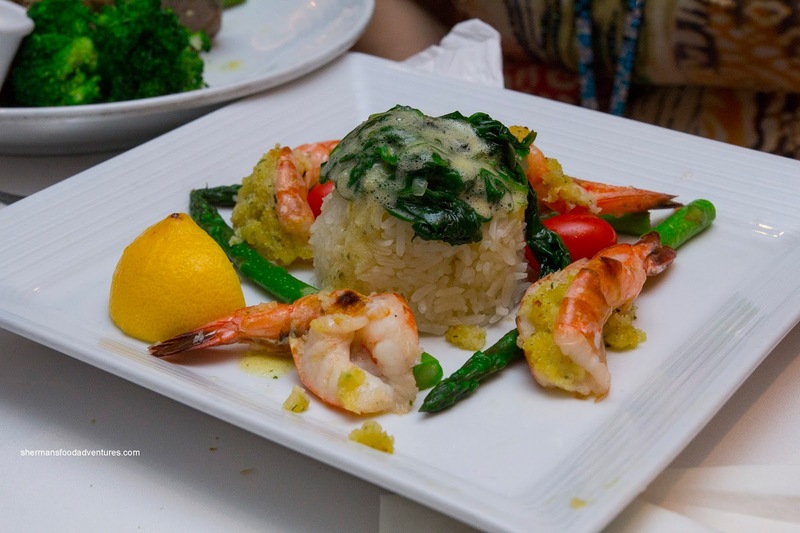 Hence, the flavors of the dish were very similar being buttery and rich. With the use of baby scallops, the dish was lacking in substance though. We also had the Shrimp Cocktail which was pretty typical with medium-sized shrimp which had a nice meaty snap. 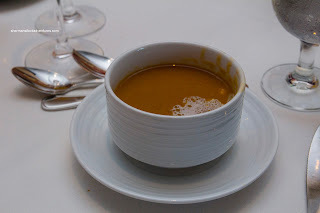 All of us had a bowl of Lobster Bisque which was thick and brimming with lobster essence. The bits of lobster were chewy though while the amount of sherry was minimal. 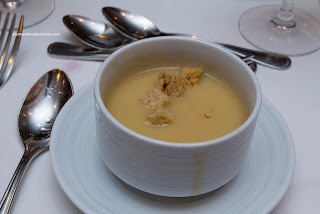 Furthermore, it suffered from the dreaded "salty bisque" phenomenon. It would've been fine with half the amount of salt used. 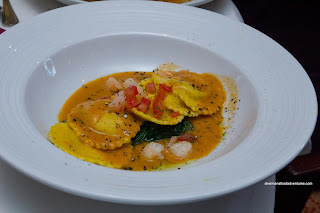 Onto our mains, I tried the Shrimp Ravioli consisting of wilted spinach, creamy thyme and corn all in a lobster sauce. 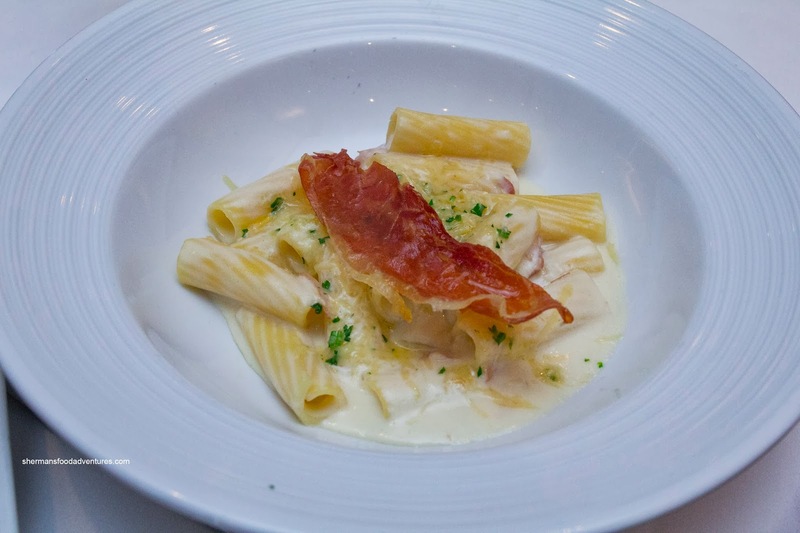 The pasta was al dente and light while the sauce was salty (much like the bisque). 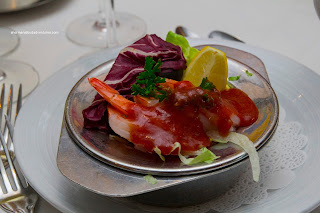 The bits of shrimp were good though, yet the filling was mushy and not that appealing. Next up was the Roasted Duck with black currant sauce, sweet red cabbage and golden potato croquettes. 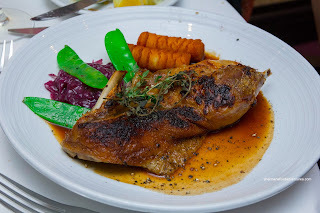 Surprisingly, the dish was constructed of an intact half duck (really filling). The meat from the thigh to the breast was moist with the natural taste of duck. Accenting the meat was the sweet currant sauce which was quite mild. We would've liked to see the croquettes a bit more crispy though. 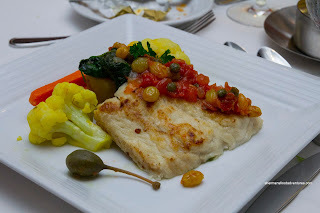 My dad ordered the Pan-Fried Silver Corvina Fillet with saffron-infused cauliflower, fondant potatoes, tomatoes, capers, sultana grapes and pine nut relish. We found the fish to be overcooked where the flesh was mushy in a Tilapia-type manner. Moreover, there were little bones strewn throughout. On the other hand, the raisins, tomatoes and capers provided a nice balance of flavors. 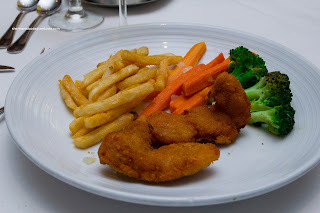 Both kiddies had the Chicken Strips and Fries (with some buttered veggies added to give the appearance of some healthiness). They were a bit dry on the inside and crispy on the outside. The fries were the starch-coated variety. The veggies were good though being cooked just enough. So on the 3rd night, we once again filed into the main dining room on cue with all of the other hungry passengers. Funny, it reminded me of a cattle call of sorts... Ironic I suppose. 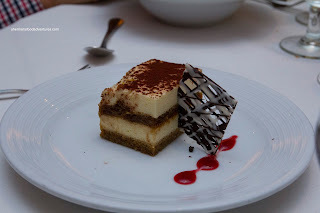 Anyways, it was deja vu for us as we started with the started with the Antipasti and the Eggplant Parmigiana (which was an entree on this menu) much like our meal at Giovanni's. 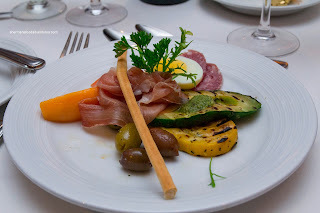 The antipasti featured nicely grilled zucchini and ripe cantaloupe. Interestingly, the eggplant was less salty than the one at Giovanni's. It did exhibit some nice features such as tart tomatoes and plenty of cheese. Our favorite appie happened to be the Creamy Roasted Garlic Soup. It was creamy as advertised with an intense roasted garlic hit. It wasn't very salty, which allowed the natural flavor of the garlic to shine. 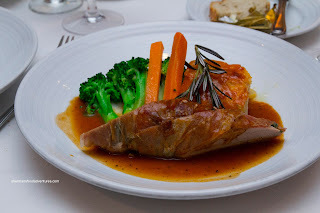 Heading into our mains, I ordered the Filetto di Maiale Arrosto con Salvia (slow roasted pork tenderloin wrapped in prosciutto and sage with Provolone potato bake, broccoli, carrots and a truffle reduction). Despite the impressive sounding title, the pork was ultimately dry and pretty bland. That was somewhat of a surprise since there was prosciutto and other flavoring elements including a curiously ineffective truffle reduction. My mom went for the Garlic Tiger Shrimp which were very much like scampi. They were garlicky with a meaty texture. The accompanying vegetables were still firm and vibrant. 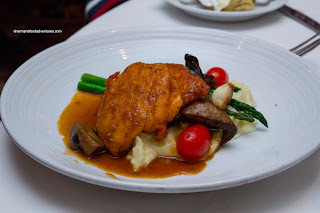 Viv decided on the Chicken Marsala (sauteed Chicken Scaloppine, Marsala-mushroom sauce, buttery mashed potatoes and fresh vegetables) and it pretty good. Being moist and tender, the chicken was much less flavorful than its appearance would suggest. 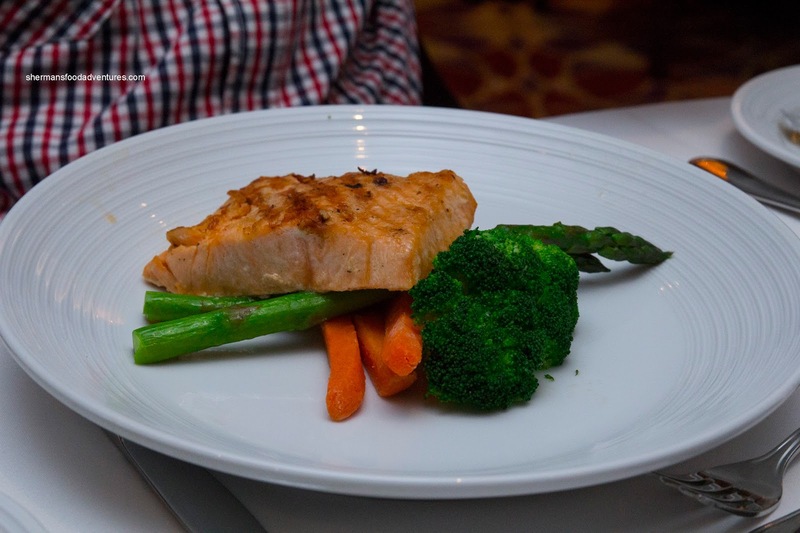 My dad went for the one of the dishes available every night being the Broiled Fillet of Atlantic Salmon. As expected the fish was completely overcooked and dry. On the flip side, it was seasoned nicely and accompanied by crisp veggies. 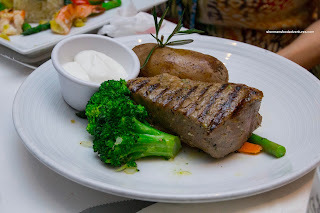 We also sampled another constant on the menu which was the Aged Hand-Cut Manhattan Strip Steak. Despite being prepared medium-rare as requested, the steak was curiously dry and mealy. It was as if the moisture was missing. Hence, it was not really all that enjoyable to eat. 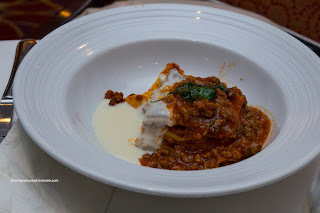 My daughter decided to not order off the kid's menu and went for the Lasagna al Forno instead. I do believe she's related to me! It wasn't half-bad with well-constructed layers which held together after each bite. The half and half of cream and beef bolognaise sauces created a balance of sorts. For dessert I decided to try the Dessert Sampler featuring flourless chocolate cake, vanilla cheesecake and elderberry mousse with strawberry jelly. I found the cake to be rich and chocolaty with a slight bitterness accented by a mild sweetness. The cheesecake was somewhat sweet with a smooth texture while the mousse was not too sweet exhibiting some tartness. 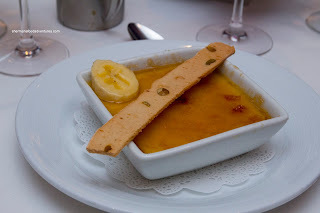 My mom had the BBB Creme Brulee which was a complete fail. The sugar topping was non-existent and in fact, was not even torched properly. Therefore, it was just overly sweet runny Bailey's-flavored custard. This was a pathetic attempt at a creme brulee. Viv decided on the Tiramisu and had a weird jello texture. 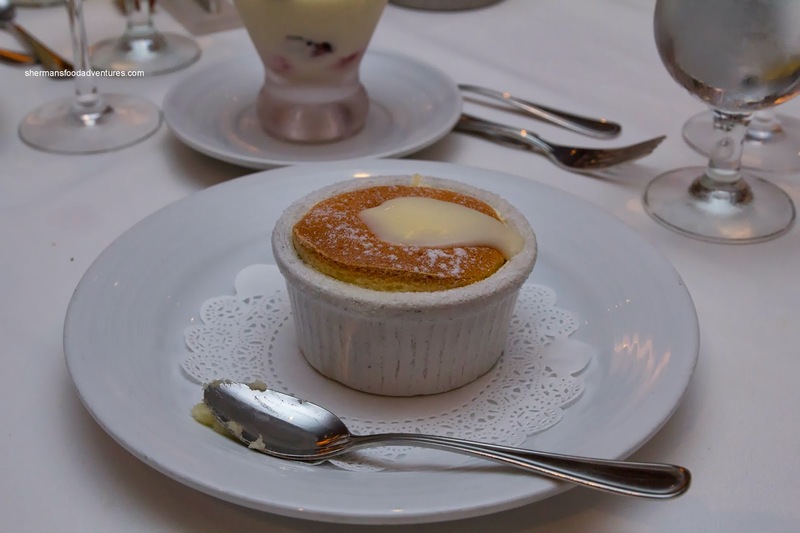 Rather than creamy marscapone, it was stiff and bland. 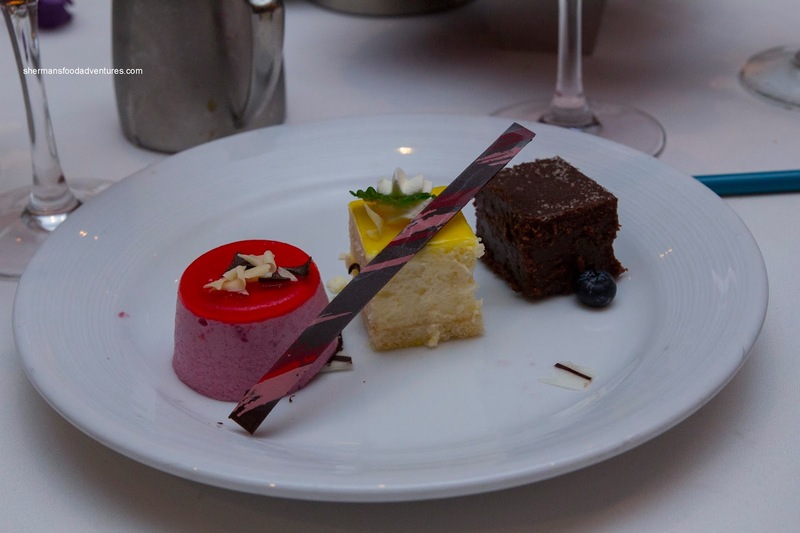 As you can ascertain, the desserts on night 3 were terrible, period. After dining at Chops Grille on night 4, we returned to Adagio for our 2nd formal night (aka lobster night). 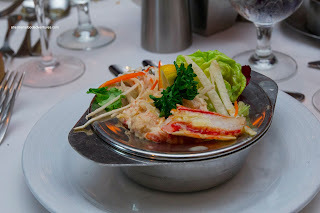 I started with the Royal Seafood Salad consisting of crab, shrimp and lobster on a jicama slaw and citrus drizzle. I didn't mind this as it was sweet and fresh tasting. It wasn't overdressed and I liked the crunchy elements as a textural contrast. I also had the Roasted Poblano Pepper and Corn Soup with cilantro oil drizzle. I really liked this as it was spicy and smooth with the sweet pop of corn. It was natural tasting and wasn't the victim of overseasoning. 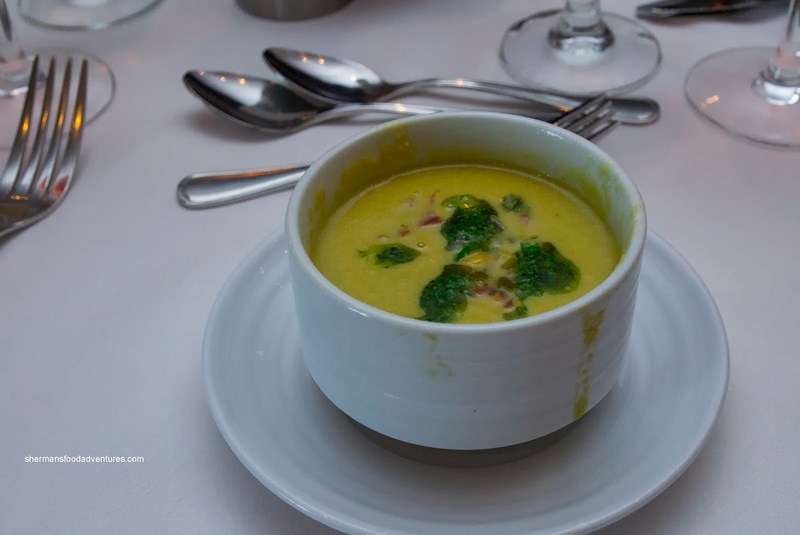 It was somewhat like a spicy version of a cream of corn (no, not like the canned version). Viv opted to try the Double Duck Consume with aged port and julienned vegetable melange. This was also quite good as it was not over-salted. It was sweet and reminded us of BBQ Duck in a consume. 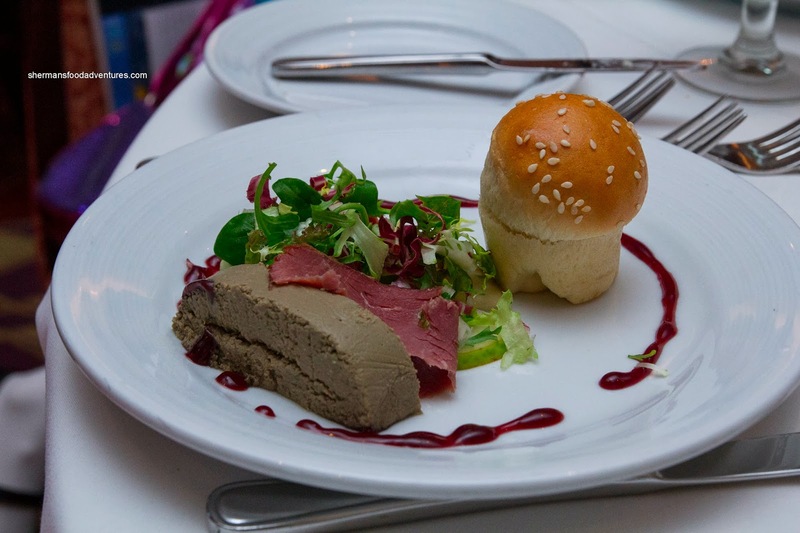 Viv also had the Duck & Port Wine Terrine made with smoked duck and accompanied by prosciutto, mixed baby lettuce, shaved Anjou pear, brioche and red currant port syrup. Naturally, the terrine was "livery" with a hit of port. The color was an off-putting grey but it was smooth enough to spread on the soft brioche. 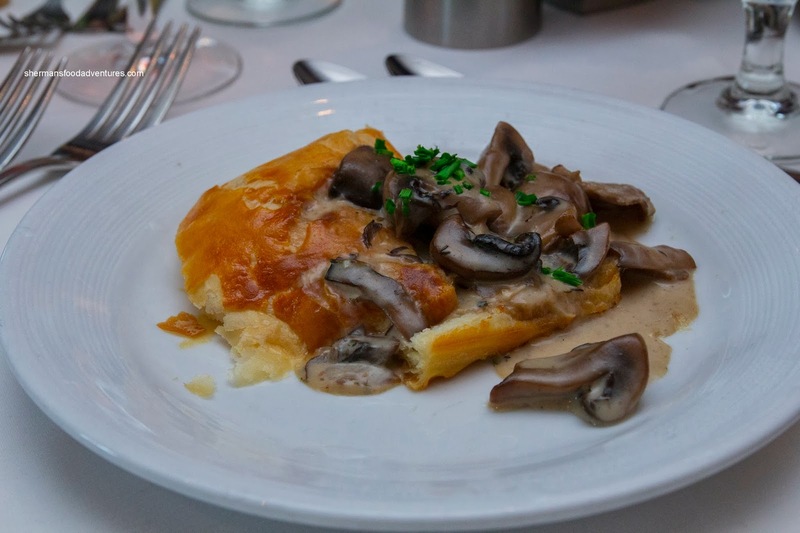 Our daughter ended up ordering off the regular menu again and ended up with the Creamed Wild Mushrooms served with flaky puff pastry. This was a pretty straightforward appie that featured nicely sauteed mushrooms with a creamy and rich sauce. The puff pastry was indeed flaky and crispy. Although officially listed as an entree, the Snow Crab Salad should've been an appetizer. 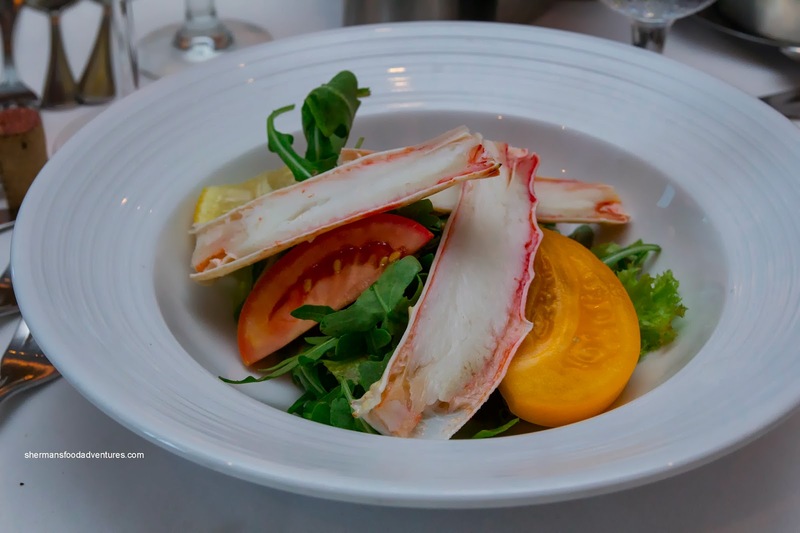 It was merely a few small portions of snow crab legs atop lettuce and tomatoes. We found the crab to be rather salty and somewhat spongy. 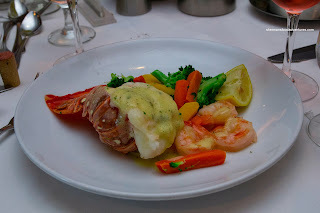 Onto the mains, we all had the Fisherman's Plate consisting of a broiled lobster tail, garlic shrimp and veggies. Despite appearing impressive, sadly, the lobster tail was overcooked and chewy. As much as the shrimp exhibited a buttery snap, they were super salty. 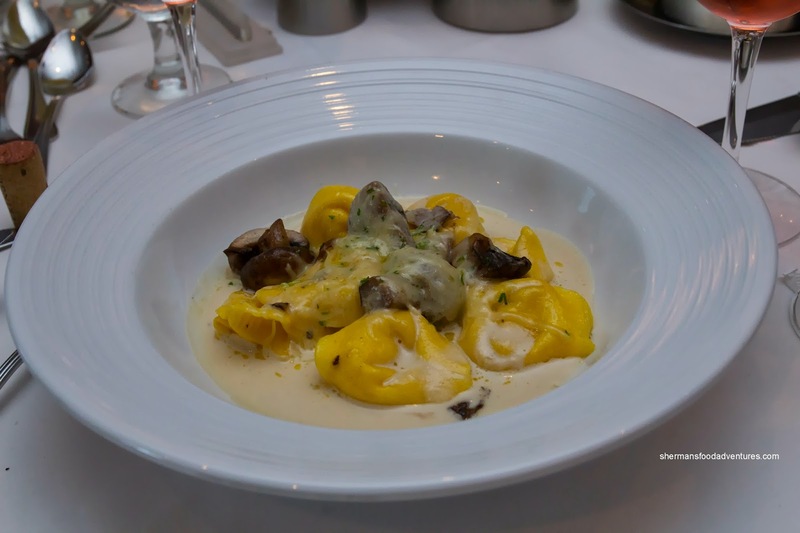 In addition to the lobster, we tried the Three Cheese Tortellini for kicks. We found the pasta to be far too soft, but the filling was cheesy as was the marscapone sauce. The addition of mushrooms helped break up the monotony. 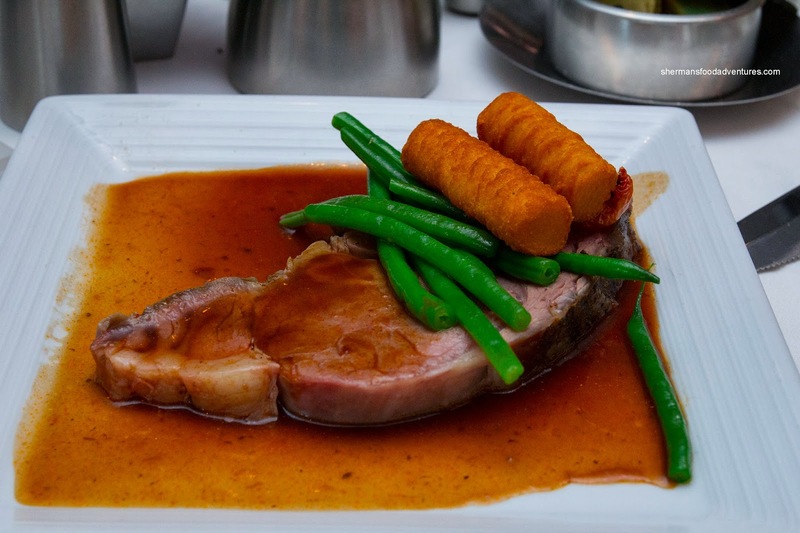 And really for good measure, we shared an order of the Slow-Roasted Prime Rib served with potato croquettes, semi-dried Roma tomatoes, green beans and horseradish au jus. The prime rib was well-seasoned being buttery soft. It was more medium than medium-rare as requested. The sauce was meaty and had depth and only the slightest hint of horseradish. 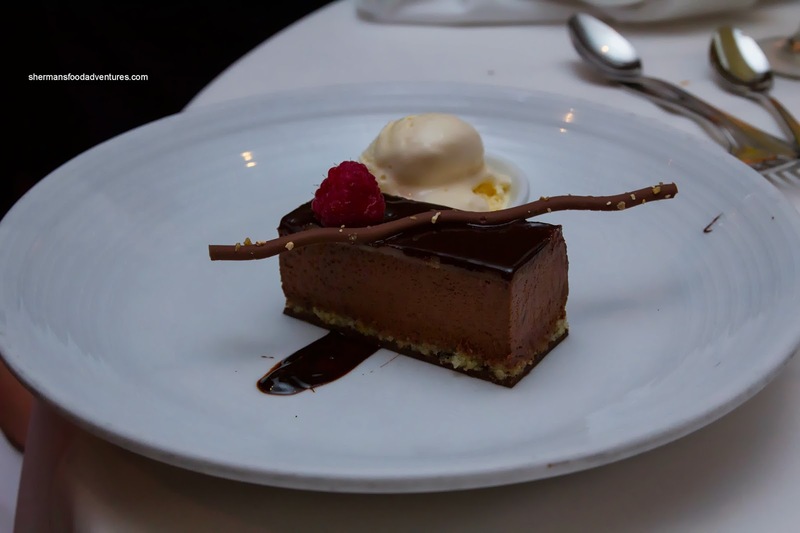 Moving onto dessert, I decided on the Chocolate Sensation made of espresso sponge, chocolate truffle mousse, almond icing and chocolate glaze. This was decent with a silky texture and not incredibly sweet. I didn't get a huge hit of espresso, but the chocolate was definitely there. 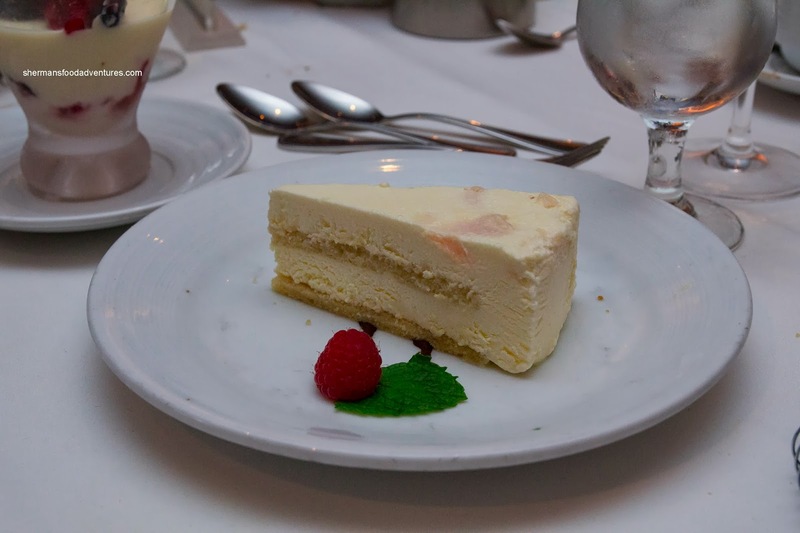 My dad tried the Sugar-Free Coconut & Lychee Gateaux which was predictably light in texture and taste. I thought that the lychee could've been more pronounced though. Lastly, my mom had the Grand Marnier Souffle. As you can see from the picture, it didn't really rise and/or it settled. Whatever the case, it was fine though being soft with a sweet vanilla sauce. We skipped night 6 in favor of 150 Central Park only to return on the last night for dinner. It was only Viv, myself and the kids as it was my parents turn at 150 Central Park. Viv started with the Chilled Pineapple and Lychee Soup. 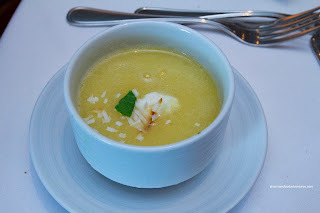 I don't know about you, but I'm not a huge fan of fruity soups because they tend to eat like a tropical drink. In this case, it was no different as it was sweet, yet refreshing. The addition of coconut made it taste like a pina colada. 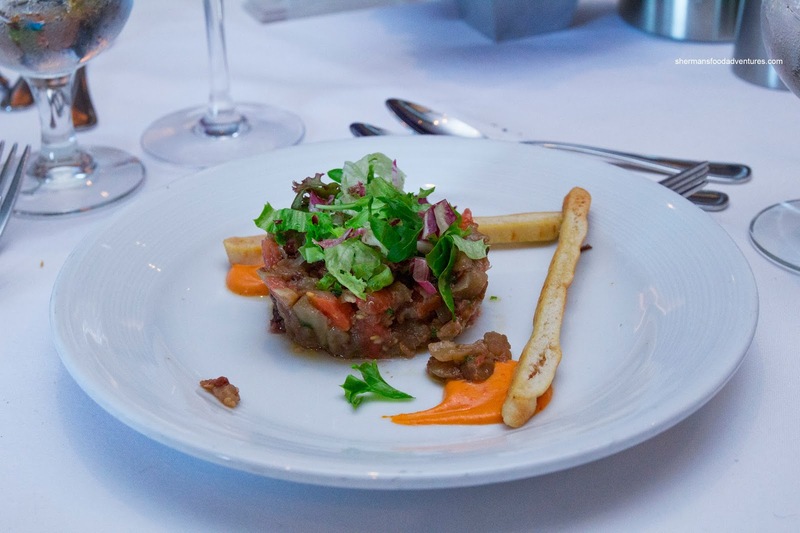 For myself, I had the Eggplant and Kalamata Olive Tartar with roasted red pepper hummus. I found the texture of the eggplant to be just right neither being too firm or mushy. There was a nice tartness to it while the red pepper hummus was smooth and flavourful. 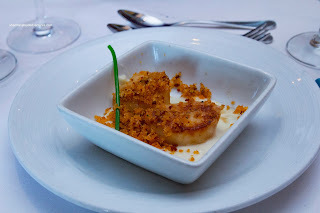 Both of us also had the Pan Seared Sea Scallops and Chorizo with cauliflower puree and crispy pancetta & herb crumble. Buttery soft and retaining a bite, the scallops were nicely accented by the crunchy topping and creamy puree. This was well-prepared. 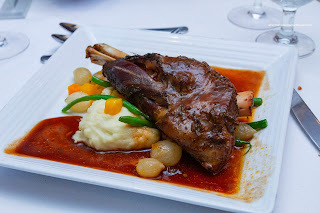 Onto our mains, I opted for the Rosemary Lamb Shank with green beans, caramelized pearl onions, roasted pumpkin and Cabernet jus. This was a substantial portion where the meat was gelatinous and moist. The sauce had depth while bordering on salty. The buttery and fluffy mashed potatoes helped soak up all the jus. Viv went for the impressive-sounding Fish, Seafood and Mash, but it was really just a plate of fried seafood. 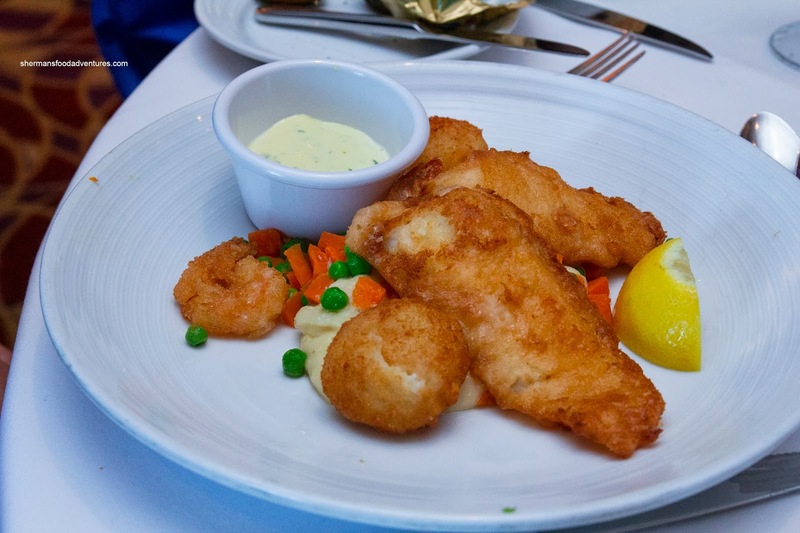 Consisting of cod fillet, sea scallops, shrimp, minted peas, mashed potatoes and a remoulade, this would've been something one would find at any "seafood" joint. With that being said, the fish was flaky, albeit soggy and not crispy at all. While the shrimp was okay, we found the scallops to be overcooked and hard. As for my daughter, she skipped the kid's meal (good girl!) 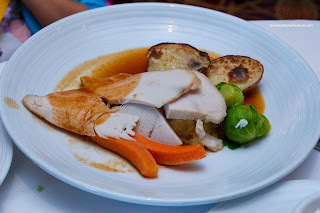 and had the Roasted Turkey with apple bread dressing, cider gravy, roasted red bliss, brussel sprouts, carrots and cranberry sauce. Despite its dry appearance, the slices of turkey were relatively moist. The gravy was on point with plenty of meat flavour and essence. We also got an extra entree being the Rigatoni Pasta in a prosciutto-Chardonnay sauce topped with grated Piave cheese. The rigatoni was quite soft and not close to being al dente. As for the sauce, it was creamy and cheesy. 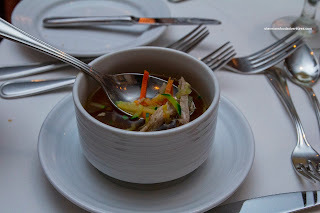 The overall flavour profile was just plain salt as it overwhelmed everything else. I loved the crispy prosciutto on top though. 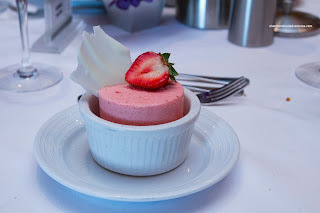 For dessert, we only had 2 starting with the Frozen Strawberry Souffle. As the description stated, it was refreshing and frozen. 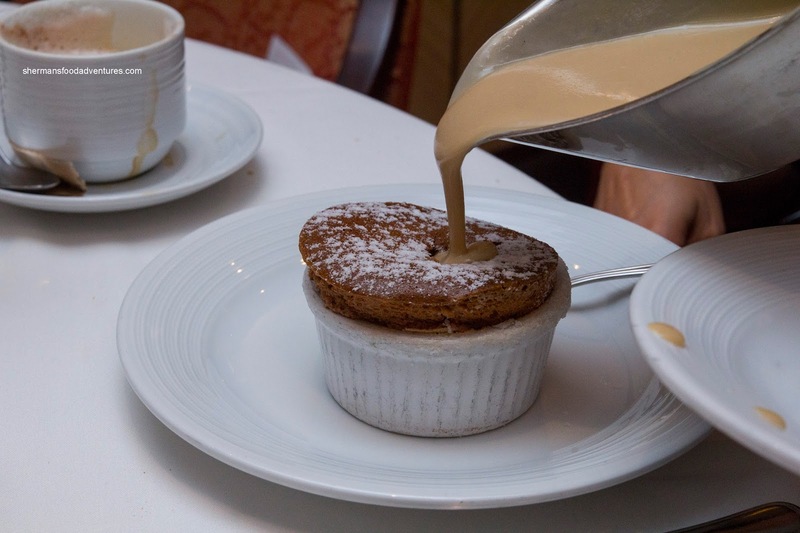 Naturally, it really wasn't a souffle. Rather, it was more like really cold strawberry mousse. Lastly, we shared the Key Lime Pie which was pretty good. 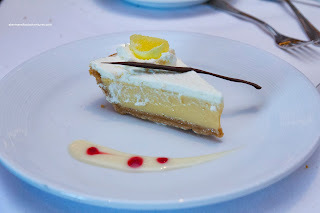 It was tart and only semi-sweet with a nice silky texture. The crust exhibited a light crunch which contrasted well with the pie. 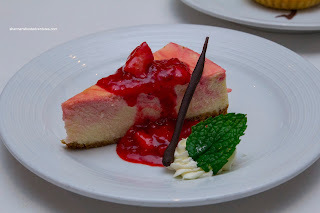 This was a good end to an up and down overall experience at the main dining room aboard the Allure of the Seas. We could appreciate the challenges of producing so many plates of food for a ship this large, yet some of the items were just not prepared properly. With that being said, nothing was inedible and there were a few gems. Comparing to the most recent cruise before Allure, I have to say the food aboard the Oosterdam was better.